All Things Crafty: Happy New Year! 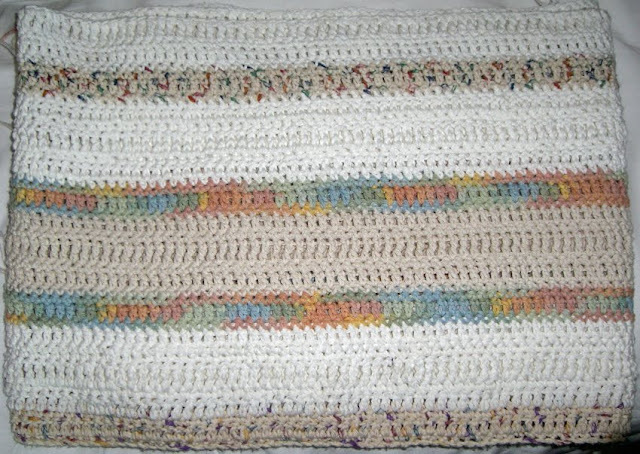 During my free time back at the apt, I've been crocheting my first afghan. I am doing my own pattern which seems to be taking a lot of time and a lot of yarn. I think I brought maybe 12 rolls with me and now I'm out of a specific color and need to wait for the delivery man to deliver some more. Hubby is halfway completed with treatment so I don't think I'll finish it before we leave. I'm using Lily Sugan n Cream yarn which comes on smaller spools. It's a nice cotton thread and seems to be making a durable afghan. I'm just using single, double, and triple crochet stitches. Here's what I have so far. It' about the length of the twin bed. That's my target size, finish for a twin bed. It's mostly white (which is what I ran out of) and subtle pastes and ecru. The photo doesn't capture it well. While I'm waiting on the white yarn to be delivered, I'll try something else with the extra colors I brought.